This new release from Norwich quartet flirts with Reggae for a fair proportion of its three minute existence but it’s saved from that fate by the strong vocals of frontwoman Caitlin Mapes. 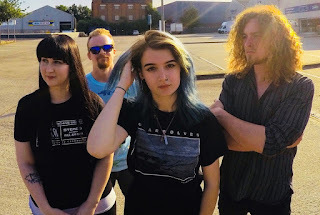 ‘Serotonin’ is undoubtedly influenced by the likes of No Doubt with its punk-ska guitars interrupted by breakouts of a ballad and Mapes’ vocals could stand up to Stefani with their rich, emotive tones and ability to switch between rock aggression and soulful pleading. Kaves aren’t the finished product but all the component parts are there, they just tightening with the right Allen key.